We don't have a clever opening for this review, so how about this: you ever wonder why mercury's atomic symbol is Hg? It stands for "hydrargyrum," which comes from the Greek for "silver water." When robotics genius Will Magnus created his miraculous Metal Men, he not only brought different metals and alloys to life, but he also gave them distinct personalities. Quick-tempered with a nasty attitude, Mercury can go from solid to liquid allowing him to pass through or fit inside small spaces with ease. He is generally angry and sarcastic, but it masks an inner nobility and true devotion to his team. [Nasty attitude? Generally angry? Sarcastic? Holy crap, yo, it sounds you've just found your DC Universe doppelganger! --ed.] Bite me. In recent years, in addition to his attitude problems, it's become something of a running gag to have Mercury harping on about how he's made of the only metal that's a liquid at room temperature. Like, the same phrasing and everything, over and over. It's nigh-Claremontian in its consistency. We're lucky he's not talking about the focused totality of his mercurical abilities. Mercury gets a body unique to him - it's long and lean, like Deadman and Creeper, but none of the parts are reused. His feet are longer and pointier than any other figure's and he has raised boot edges and gloves (double-hinged knees and elbows, too). Like Iron he wears a smock, but unlike Iron, it's not a separate piece over the body: the lower edge is just sculpted onto his legs and crotch; it doesn't look as good as Iron's dress, but it preserves the articulation, so that's a plus. 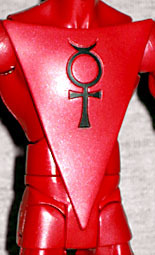 As with Gold, he has a triangular panel attached to his chest, though Mercury's doesn't have any sculpted rivets - it's just there. The head is great - the Horsemen remained so true to the character's design that it couldn't be pulled from the mold in one piece. Mercury is always drawn with a very long, pointed face, particularly the nose and chin. The nose is so pointy, in fact, that it's actually a separate piece glued into the face! This would be a great start for an Elongated Man figure. His skullcap has a thick raised edge, and the planetary symbol for Mercury (logically enough) on the brow. Unlike the previous two Metal Men, Mercury doesn't have any "construct" accessories that slip on over his hands - instead, he gets a replacement had with the construct built in. He's using his flowing metal body to create a large pair of scissors. The blades have a pivot and so actually move, though they're not sharpened, so no cutting anything for real with them. 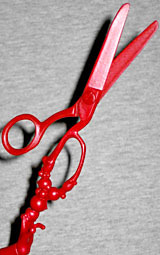 The base, where the scissors meet the hand, is done as a large series of bubbles because, hey, why not? The set comes with a second "plain" hand, which can be swapped out easily enough. Unfortunately, the wrist on mine broke when I was putting it in his arm, so I'm left with only the "scissor" hand for display, because it's not like these have actually shown up in any kind of numbers yet. Mercury comes with Bane's chest, but the Series 16 build-a-figure has an unannounced surprise in store for us! The torso has the top part of Bane's costume, of course, but it's a separate PVC piece that you can remove easily - you can decide for yourself whether you want the traditional Bane, or one who's stripped to the waist in preparation for battle. This was quite unexpected, but maybe they're looking at reusing the body later. We've now got three Metal Men, which is more than any other toyline has ever managed, but no more are currently on the slate: hopefully we'll be able to say differently after SDCC next week, because half a team is no team at all. Mercury is a really nice figure, probably the best of the three Metal Men we have so far - it's just a shame about that wrist.